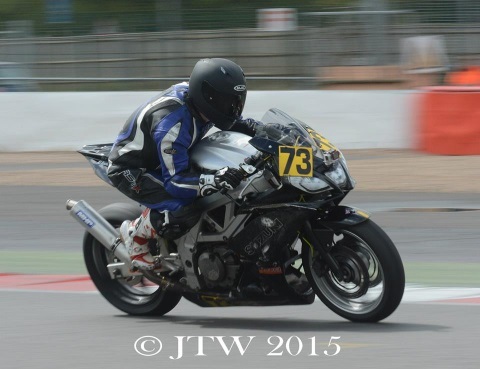 Well this weekend was my annual visit to Silverstone for some hooning around on the bike in the thunderbikes and minitwin classes. As it has been 6 weeks since I was knocked unconscious at brands hatch I thought I would start saturday with a crash. Fortunately I just broke a brake lever, brake lever protector and a foot peg. This all came as I started the first race in 10th on the grid, 8th in class which I think is my second best start position and I really thought was a great opportunity. I got the repairs sorted in time for the 12 lap minitwin race. 12 Laps turned into 8 as the race was finally red flagged but I felt good and the bike with its new forks felt fantastic. I competed in four Thuderbike (TB) races and two Minitwin (MT) races. After the off I started the second TB race in 39th and battled my way up to 25th, 16th in class. In my second race I made it up to 24th, 15th in class and my first TB point. Third race I finished in 20th, 12th in class and 4 more points. I started my first MT race in 30th out of 37 competitors, finishing in 31st. The second MT race I finished in 24th. My best time all weekend was a 1:20.882 slower than last year. All in all I enjoyed this weekend and feel like I am finding my feet again on the SV. Onwards and Upwards. TB Race 1. I qualified 8th with a time of 1:22.323 and crashed on the first lap. MT Race 1. I qualified 30th with a time of 1:21.570 and finished in 31st with a fastest time of 1:23.067. MT Race 2. I started 31st and finished in 24th with a fastest time was 1:21.159.